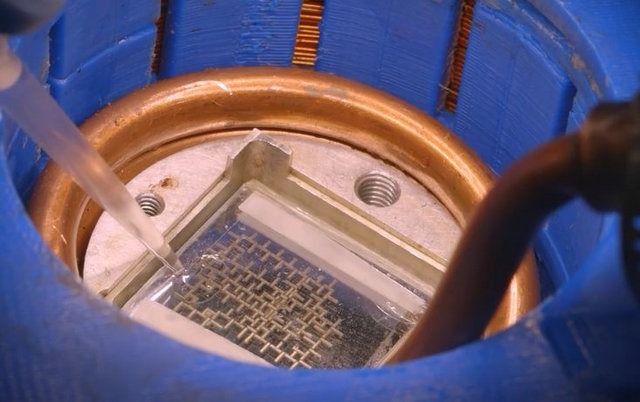 Manu Prakash, an assistant professor at Stanford University has built a computer that operates on water. It gains its energy from moving water droplets. The idea stuck Mr. Prakash when he was a graduate student. In his work, he has combined droplet fluid mechanism with the basic element of computer science – the CLOCK. He has named his new device “The droplet computer”. The droplet computer can hypothetically achieve any process that an electronic computer does. Prakash built arrays of iron bars on a glass plane. It looked like a maze. A glass was laid over the arrangement. The air gap between the planes was filled with oil. The next step was his biggest challenge. He had to inject the water droplets into the maze. In order to achieve this, he infused the water droplets with magnetic nano particles and carefully injected the droplets manually. Now the arrangement was placed in a magnetic field created by copper coils. Any current carrying conductor has a magnetic field around it. And the magnetic field can be controlled by the current direction and the amount of current. 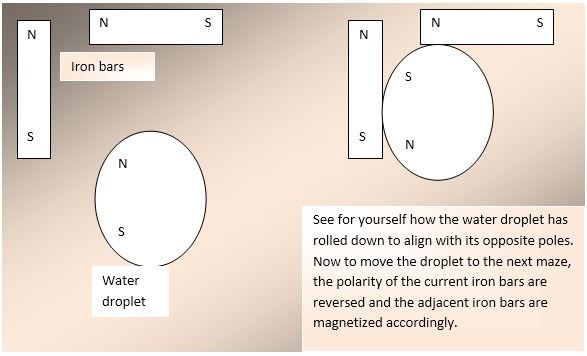 Applying this principle, the movement of the infused magnetic droplet was now controlled by the field. The black dots are the droplets. 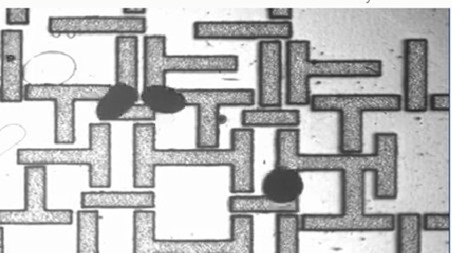 The droplets move because of the controlled magnetic field. Every time the magnetic field changes, the polarities of the iron bars change and thereby the droplets are kept in motion. The water droplets are magnetic. Meaning, they have a north pole and a south pole. The iron bars are magnetized by the current in the copper coil. How? Iron is a ferro magnetic material. 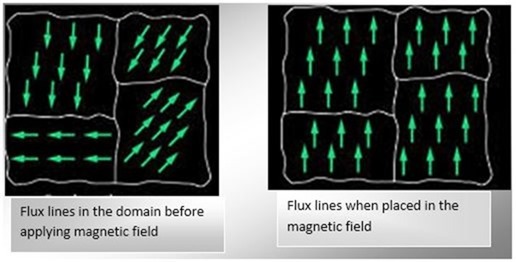 Whenever a ferro magnetic material is placed in a magnetic field, the smaller domains align themselves in a particular direction and thereby adapting magnetic properties. So we have two magnetized components. One, the iron bars and the other water droplet. The motion of the droplet is explained as follows. The presence and absence of the droplet is coded as 1s and 0s. There he has found his clock. A computer clock is nothing but a continuous 1 and 0. The professor thus found his clock running on a water droplet and thereby a computer running on a water droplet. The professor is waiting for investors to join hands to enable him reach the concept to the broader market. Techno freak designed to design technology. An electronic design engineer, passionate about writing!